Four Shapes and Three Colors-These beanbags are the perfect size for tossing activities. Nicely weighted balls that are great for exercise or for persons who need to carry or hold a heavy object. The yellow ball is adequate for most children in kindergarten and above. For self-calming or strengthening. These weighted beanbags can be carried or thrown. 8” x 4” 1lb. This vest is designed so that the weight actually lies upon the front and back shoulder girdle area to apply pressure directly into the muscles and sensory receptors. This stylish denim vest does not look "therapeutic." It is machine washable. These cute puppies are vinyl for easier wiping and are blue in color. They weigh about 3.75 pounds. 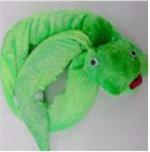 This may be the perfect lap toy or carry around for persons who require heavy proprioception. This is one friendly snake you would not mind having wrapped around your neck. The weight is good for calming - relaxing. Feels good on tense shoulders! Our snakes are made out of Denim. Additional weights for weighted vests. These vests are individually sewn from a variety of materials. Individual pockets throughout the back carry rust-proof weights (Zinc coated steel washers). Child’s vest comes weighing three pounds with room to add more weights. Please specify SIZE.